Andrew de Harcla or Harclay was knighted in 1303 by Thomas of Lancaster. As the fourth of six sons he would have to make his own way in the world and by 1312 he was on his journey to success. He was sent to Parliament as a knight for Cumberland. It wasn’t long before he became the ‘custos’ for Carlisle and the castle. He started to hold other castles for the king, including Pendragon Castle. Following the death of Robert de Clifford in 1314 at the Battle of Bannockburn he also found himself responsible for Appleby and Brougham Castle while Roger de Clifford was deemed too young to hold the castles in his own name. De Harcla found himself responsible for the security of the north at a difficult time. Robert Bruce seeing the difficulties that Edward II managed to get himself into with his assorted favourites and bolshy barons (the Lord Ordainers) decided to snaffle some territory. 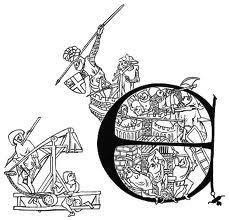 The lifestyle of raiding and warfare was on its way to being endemic by the end of the period. Prior to Bannockburn in the year 1313 Edward Bruce raided the land around Carlisle and following Bannockburn de Harcla found himself besieged for some ten or elven days in 1315 by the Scots with siege engines. Only the rumour that the Earl of Pembroke was on his way with a relieving army and that Edward Bruce had been killed in Ireland sent the Scots on their merry way once more. This initial letter from the Carlisle Charter shows Sir Andrew defending the castle. King Edward II initially recognised the importance of de Harcla as a stabilising force in the north of the country. In 1320 he gave de Harcla the right to help conserve a recently made truce with the Scots. This meant that there was a degree of interchange between the two sides to ensure that justice was met according to the treaty. This was reinforced in 1322 when Edward gave Sir Andrew power to treat with the Scots – again, initially this seemed to be of benefit to the King. Letters from Thomas of Lancaster to the Scots revealed that the king’s cousin was fermenting rebellion. In 1322 de Harcla found himself taking the field against Thomas of Lancaster at the Battle of Boroughbridge. Thomas knew that he had to cross the river but when he arrived at the bridge it was held by the king’s men. After a ferocious battle the two leaders made terms. Lancaster tried to remind de Harcla that he owed his knighthood to him and that if he joined the rebellion against Edward II he would be further rewarded. Andrew said no and the two armies settled down for a sleepless night – although unusually it was de Harcla who spent the night out in the cold guarding the bridge while Lancaster and his men were billeted in Boroughbridge. Lancaster is said to have cursed de Harcla saying he would die a traitor’s death within the year. At first this seemed unlikely, Edward loaded Sir Andrew with rewards for his service including making him the first Earl of Carlisle. Unfortunately de Harcla was not left in peace to enjoy his new title. Before long the Scots were on the march. They laid siege to Norham Castle in the East and pushed south to Byland where an English army were soundly beaten. Edward II did what he did best – he ran away. The Scots plundered Ripon and did nasty things to Beverley. It was the final straw for de Harcla, despite the fact that his permission to make treaties with the Scots had probably expired by that point he had a cosy little chat in Lochmaben Castle about the possibility of recognising King Robert Bruce and bringing the war to an end. The Lanercost Chronicle roundly denounces de Harcla as a traitor- as indeed did the king- but at least the Chronicle makes the point that the ordinary people would have been very grateful for a bit of law and order and the chance to grow things without the Scots coming along and causing chaos. Edward had de Harcla arrested in the great hall of Carlisle Castle by Sir Anthony de Lucy. De Lucy was probably quite gleeful about this as he’d had a bit of a land dispute with de Harcla and now got all the property that he wanted…think Monopoly but a bit more dangerous. Sir Andrew was stripped of his earldom and his knighthood and then he was taken out to the gallows at Harraby Hill where he was hung, drawn and quartered and all without the benefit of a trial beforehand. His decapitated head was, apparently, taken to Knaresborough Castle for Edward to inspect before it was placed on a spike with a nice view over London Bridge. Eventually de Harcla’s sister was allowed to collect up the scattered body parts from their various locations – Carlisle, Newcastle and London to name but three and his remains were interred in the church at Kirkby Stephen. Ironically Edward was eventually forced to recognise King Robert of Scotland – in part because he’d had his best commander in the north executed for trying to protect Edward’s subjects. This entry was posted in Anglo-Scottish history, Border Reivers, Carlisle, Fourteenth Century, The Plantagenets and tagged Andrew de Harcla, Andrew de Harclay, Bannnockburn, Byland, Carlisle Castle, Carlisle Charter, Earl of Carlisle, King Edward II, Kirkby Stephen, Lanercost Chronicle, Robert Bruce, Robert de Clifford, Thomas of Lancaster by JuliaH. Bookmark the permalink.